There is a new interview online from Collider who spoke to Daniel Radcliffe inbetween set-ups on the set of Victor Frankenstein. This seems like a different type of role for you. Was that part of the attraction? I think all actors do that. All the actors I admire – look at James McAvoy’s work – it’s so varied. That’s what I aspire to… I enjoy any type of physical transformation. I enjoy working with the hair and makeup department and I enjoy watching people be very good at their jobs. But this is definitely the most heavily made up I’ve ever been. I’m not sure if it’s a deliberate thing but I think most actors enjoy looking in the mirror and not seeing themselves. What is Igor’s arc in Victor Frankenstein? Igor starts off being this abused, mistreated creature. He’s outside of the class system. He’s the lowest of the low. [The movie is] all about Igor’s empowerment. Victor finds him and shows him a world where his intellectual gifts are valued rather than unappreciated and where he is seen as a fully-fledged and extraordinary person rather than dirt on someone’s shoe. Then, of course, he develops this insane loyalty to Victor. 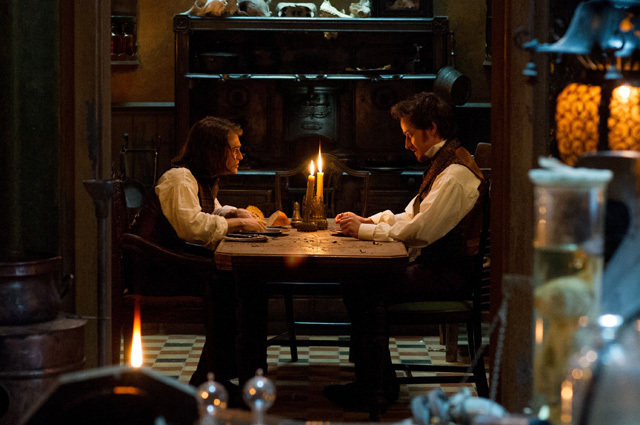 [Victor Frankenstein] is about that loyalty being tested. Is it fair to say Igor is Victor’s first ‘creation’? Victor saves me and then creates me. He gives me this identity and new physical appearance. You need to establish that loyalty because [Victor] treats me so badly throughout the film that you would be [wondering] why bother with this guy. At the end of the film, [Victor’s] pushed everyone so far away that I’m the only person who would even possibly try to save him. It is a really nice way of tying these characters together in an extreme but understandable way. Did you look to any of the other performances of Igor in films past? Other than the ones I’ve seen and grown up loving, Marty Feldman is one that I get referenced a lot… I’ve played a few parts where there have been other people who played them. Equus – I had to deal with that. How to Succeed in Business – same thing. I’m always worried about being influenced by it too much, especially with this where it’s such a fresh take on Igor. I didn’t want to… I’m a terrible mimic. If I see stuff to hang onto, I’ll probably do that. So I tried to create it myself and not do Marty Feldman or too many things from that film. What’s the process of doing action sequences with James McAvoy? In my experience of doing physical scenes, half of your energy is spent on trying to get the other actor to enter into it physically with you. Most actors don’t want to hurt each other. But James and I have confidence in each other. It’s amazing working with James on that level because he gives a hundred percent physically every time. He has thrown me around quite a bit. I like to think that I’ve been the most willing victim that he’s ever had on screen. The first day was him repeatedly slamming me against a pillar. That set the tone. What is the toll on your costume and prosthetic when performing these stunts? Not so much. On the first day, slamming against that pillar, I had a prosthetic on — not the full hump but the hump when it’s been drained. So I had that on for three hours and then put a costume on over it. Then James is landing on it every time and hitting the prosthetic time after time after time. At the end of the day, after doing that for seven hours, that’s when they were like ‘Close-up of the hump’; but it actually held up remarkably well. James has got this brilliant ability to really make it look like he’s slamming you up against the wall while actually taking most of the impact himself. What separates this iteration from other versions of Frankenstein? One of the big differences is when ‘The Monster’ is created because [it] isn’t created until the end of [Victor Frankenstein]. So it’s less about the monster and what happens to the world after this monster is created. It’s more about the relationship between Frankenstein and Igor that precede it. What is the conflict between Igor and Victor like? The battle for Igor is that once Victor has rescued him and he’s developed this insane loyalty to him, then Victor starts going off the deep end ego wise. It starts off being very well intentioned. I want to create life and do something incredible to change the world but as [Victor’s] ego takes over it becomes more about how far can I push this. What crazy insane thing can I do just because I can? For Igor: the chance to change the world for the better is something he never thought he would get so entering into that he’s incredibly excited. [He] wants to be a part of that but then the battle for him is to work up the courage to stand up to Victor and tell him to stop. The film plays with the notion of good guys and bad guys. [Victor and Igor] do have an antagonistic relationship at times but Victor is one of my heroes. He’s charming and charismatic and incredibly fucked up and dangerous. But because he’s so charming, I feel the audience will be with him. He’s very likable but simultaneously he’s very amoral and treats me like crap at times. On the flip side: Turpin, played by Andrew Scott, who is the antagonist to Victor and I, who is pursuing us through most of the film, is actually a really sympathetic character. He’s someone who you absolutely can’t say is bad for bad’s sake. He has an incredible amount of sympathy for me. He’s motivated by the loss of his own wife. Are there possibilities for a sequel here? I have no idea. If this film is successful, we can talk about it. Originally in the script, there was a really ‘we are making a sequel’ ending. Both James and I [said] ‘Let’s not do that.’ ‘Let’s just concentrate on making one really good film first and then we’ll see.’ So I don’t know. I’ve had a fantastic time so I feel like I would. But there are so many more things that would have to happen for that to become a reality. What is your relationship with director Paul McGuigan? There’s a bizarre connection between Paul and I. My dad was Paul’s agent after he made The Acid House. So he knew him for years. I got the job on [Harry] Potter because of Paul’s film Gangster No1, which Norma Heyman produced. She’s the connection to David Heyman and Potter. That’s how that got linked up originally. It’s all very incestuous. I never met Paul back then but I got to know him very early on in this. I’d been attached to [the film] before Paul was involved because I really liked the script. Paul brought a real sense of danger and menace to the world. [The script] felt a little like ‘film-danger’ where you know they’re going to be okay in the end. You don’t want that. The threat has to feel real. It can’t be funny circus slapstick violence. It has to be nasty. Paul brought a real grounding so that this felt like a very real film. What are the limitations of a PG-13 horror film? We’re pushing it as far as we can. Things get quite gross. It’s hard to talk about without giving too much away but there are a couple of creations – one specific creation, a prototype of the thing we end up making – that is pretty gruesome. One of the most stomach turning scenes in the film [is] where I go from being a hunchback to not being a hunchback anymore. It’s so gross. It’s puss related [which] James gets rid of it himself in a very visceral way. It was one of those scenes where our producers were outside going ‘Guys – can you do one where we do a less disgusting version?’ ‘No, no, no – this is how we’re going to do it.’ You want it to be PG-13 but it’s a movie about science and bodies and muscle and stitching stuff together. You have to be able to show that. How much did the script change during rehearsal? Paul is really inclusive that way. James and I had a great week of rehearsal where we just went through the script and said what worked and what didn’t. [Screenwriter] Max Landis [Chronicle] has a really strong voice that rings through every page of the script but one of things that for me was a problem – I felt like Victor and Igor spoke with similar voices both of which were Max’s. Max is a very talkative person. That works for Victor brilliantly but Igor hasn’t come from the same education or background so for him to sound the same would be a bit of a mistake. I think [Igor] could sound similar to [Victor] as the film goes on because he’s under his influence but early on I really wanted to make sure there was a distinction.